Babies are just defective adults. Or at least, that's what a lot of people used to think, according to Alison Gopnik. PhD. But we have discovered that babies are capable of learning very quickly. More than any other species, humans invest much more time to childrearing, and it pays off in the form of smarter adults. Dr. Gopnik gave an example from the bird world, comparing crows and chickens. Crows, taking 1-2 years to mature, a very smart, spending a lot of time learning, for example, how to make tools. Domestic chickens, on the other hand, mature in a few months and are not particularly bright, by comparison. Taking time to learn may not be very good at developing to fill a specific niche, but it is wonderful at adapting to a wider range of situations. Children, Dr. Gopnik says, are like the R&D department, the "blue sky" thinkers. As their brains develop, the connections that are used a lot are reinforced, while those that aren't get pruned. Their young brains are good at innovating, developing new ideas, but aren't particularly great at any one thing. By contrast, adults are sort of the PR or marketing department. Though less flexible, they tend to have become very good at specific things. What makes baby brains so good at learning? They're essentially running Bayesian computation. They do experiments all the time, though we call it "getting into everything" or "playing". If you ask a child to explain some anomaly, they'll try a lot of different things until they get the right answer. When confounders pop up, they'll just keep playing around 'til they figure it out. Unfortunately, this exploration can be hampered by authority. Dr. Gopnik related an experiment in which children were presented with an unusual toy with four different properties: a squeaker, a mirror, a light and music. Two conditions were set up: the teacher tells they child they don't know how the toy works vs. the teacher explaining how it works. Both conditions involved the squeaker being pressed, either by "accident" or as part of the instructions, but no other properties were demonstrated. The children were then left alone to play with it. In the first condition, the kids explored and discovered all four properties, while in the latter condition, the kids stuck with the squeaker and did not investigate further. The bottom line is that kids are great at exploration, and we should foster that way of thinking. Deference to authority, a trait shared by both kids and adults, can stop innovation. Cady Coleman: Six Months on the International Space Station: Was it all a Dream? 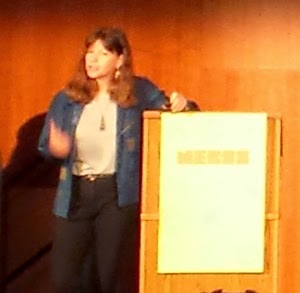 Next up was astronaut and panelist from NECSS Day 1 Col. Cady Coleman, PhD (USAF, Ret.). Col. Coleman, who was consulted by Sandra Bullock for the movie Gravity, has been to the International Space Station twice and recounted what it is like to be in space, as well as the type of science that is conducted on the ISS. Getting around in space isn't so much a matter of floating, but rather of flying. Something as delicate as a piece of human hair is enough to propel one along. Much of Col. Coleman's presentation focused on the sorts of science experiments that are made possible in space that are not possible under gravity. Studies of fluid dynamics and surface tension, for example. With water in a container, changing the angle of a corner by as little as 3° can be the difference between the water gathering in the corner or flying everywhere. Combustion experiments reveal how soot is produced, giving us insight on pollution, as well as how to burn fuels more efficiently. Medical advances come out of protein crystal growth experiments (more perfect crystals under microgravity) and microencapsulation experiments. The latter has led to improved cancer therapies, with findings from the ISS replicated on Earth. They can also study how to make more efficient methods of growing plants, and they learn how to use robots for greater accuracy and efficiency. 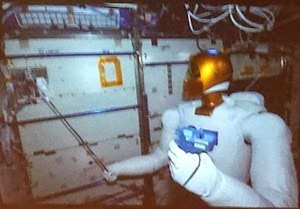 In fact, the robotic arm on the ISS that is used to capture supply ships led to the development of robotic surgery that can be done in an MRI. The astronauts themselves can also provide valuable information into nutrient loss and cardiovascular disease. In space, you lose nutrients much faster than on Earth, so this allows for more rapid experimentation. Likewise, the heart muscle tends to shrink after extended periods in space, to the point that it resembles an aging heart. Even eating and waste disposal lead to new technology on Earth. Their filtration systems ("Yesterday's coffee, today!") have applications for developing nations, where clean water is scarce. Col. Coleman's talk was absolutely fascinating, and it's little wonder that during the break afterward, she was swarmed with people wanting to get a picture with her and ask more questions. I was able to ask about bacteria and viruses and how a microgravity environment affected them. She mentioned that salmonella, for example, becomes more virulent. Faster growth can allow for more rapid identification of targets for treatments or vaccines to combat diseases. There aren't many people who have had such a unique experience as going to space for months at a time. I'm glad I had the chance to meet Col. Coleman. 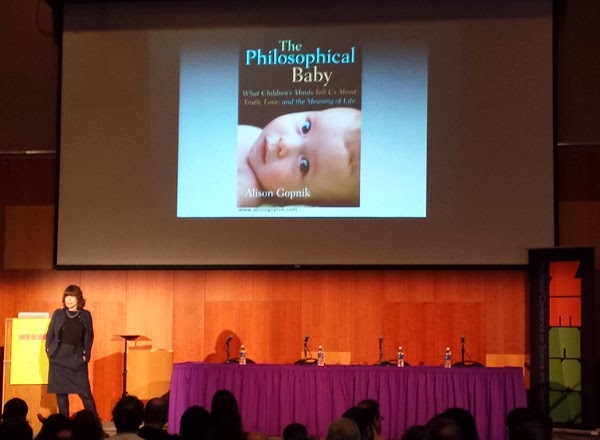 After a short break it was time for the live recording of Rationally Speaking, the official podcast of New York City Skeptics, hosted by Massimo Pigliucci and Julia Galef. This year's guest was keynote speaker Lawrence Krauss. Recently, news came out that Dr. Krauss was to appear in a film titled The Principle. It is a film that argues that Earth is the center of the universe, and that everything revolved around our little blue dot. Many people wondered how Dr. Krauss, a respected figure in the science community, could lend his name to such nonsense. As it turns out, the filmmakers apparently misrepresented themselves, then cut and pasted clips to make it seem like Dr. Krauss supported geocentrism. The episode largely centered on discoveries we have made about the universe through science, like the recent findings about gravitational waves. These discoveries show that we are a fortunate accident. "It is not surprising to find ourselves in a universe in which we can live," said Dr. Krauss. "The opposite would be very surprising." It is unfortunate that science media feels the need to include flashy graphics as substitutes for the ideas being presented, and a lot of big ideas are popularized that just aren't ready for prime time. There may be questions that we can't answer. It's possible that our universe is just an outlier, and that the more common makeup is one which is incompatible with life. Or the universe we have may be the norm. We're limited to one universe of information, and we're starting to run up against those limits. Despite those limits, though, we should pursue an idea until we find out it's wrong. And then we throw it out. Panel: GMOs - Boon or Bane? After lunch came a much-anticipated panel debate on genetically modified organisms. Moderated by Steve Novella, Kevin Folta, Chair of the Horticultural Department at the University of Florida, took the side of GMOs, while Marty Mesh, executive director of Florida Certified Organic Growers & Consumers, Inc., opposed GMOs. Leading up to this, I wondered what sort of arguments Mesh would make. Would he take a nuanced approach or would he repeat many of the common fallacious arguments against GMOs? Folta argued that there is a scientific consensus in support of GMOs and that anti-GMO organizations profit from fear-mongering. They vandalize crops and subvert science. Because of opposition, he wondered, what opportunities are we missing (e.g., golden rice)? Against this, Mesh claimed that corporate control of information is preventing research that should be happening, and that GMOs lead to unfair trade agreements. Stating that "nothing has zero risk", he questioned the long-term environmental, health, legal and social impact. GMOs, according to Mesh, lead to increased chemical use, reduced biodiversity, lowered soil quality and polluted waterways. They are not adequately tested, and he warned of allergens, toxins, disease, etc. After these opening remarks, I wasn't all that convinced by either side, though Folta's presentation was much more relaxed and confident. With Mesh, a lot of his arguments seemed to mirror anti-vaccine arguments (conspiracies of information suppression, toxin gambit, Big Agra-shill gambit, increased auto-immune disorders, etc.). So far, this wasn't looking good. On the question of food safety, Folta argued that you can never prove that something is safe; you can only find evidence of harm. He noted that studies have been done on the health effects of GMOs in fish and cattle. Mesh asserted that long-term testing has not been done or has not been transparent. Next up was golden rice. This is a variety of rice that was modified to produce beta-carotene, a precursor to vitamin A. Mesh claimed that you need fats to absorb beta-carotene and wondered if they would be handing out butter along with this rice. Could it lead to diabetes or contribute to obesity? And why not just give supplements instead? Folta answered that if supplements alone worked, then do it, but golden rice is an added tool to help improve nutrition in poorer countries, without the need for butter. The beta-carotene in golden rice, he noted, is taken up by the body as well as the beta-carotene in spinach, and studies have shown no harmful effects. The genes used are found in other plants, and this could have been accomplished by traditional breeding, but it would have taken significantly longer to accomplish. A long Q&A line formed quickly. The two wound their way through several other topics, like corporate control, corporate-public cooperation, GMO vs. hybridization, potential future directions for research and mandated labeling. Novella kept the pace quick, leaving time for questions from the audience. I don't think I've ever seen a queue form so quickly. The first couple of questions were from people who seemed to be strongly anti-GMO, one of whom had to be told repeatedly to get to her question. A common misperception is that farmers are being sued for accidentally using Monsanto seed, when such suits really only occur when farmers have actually knowingly used Monsanto seed without purchasing a use license. Mesh argued that the reason you don't see any suits involving accidental seed use is because the cases are settled and the farmers are prohibited from discussing the settlement. A couple of the more interesting questions involved biodiversity and comparability. If the parent variety of a modern crop were discovered and GMO used to bring this parent variety back to increase biodiversity, would you support that? Mesh answered the it must be adequately tested, and Folta said that this was the direction GMOs were heading. On comparability, an audience member asked Mesh, if he were in the FDA, how would he test plants? For example, if you had two plants that had identical traits, but one was achieved through hybridization while the other was the result of genetic modification, would you test them the same? What I liked about this question is that GMOs are subject to extensive testing before they are allowed to be used, while plants that are the result of traditional breeding methods are not required to be tested. Mesh's answer was telling: he dodged by saying he doesn't know science well enough to recommend a testing regime, and that he would consult with scientists. In the end, it was an interesting debate, but somewhat disappointing in that the anti-GMO side was more of the same that I've already heard and which has been adequately addressed by science-based individuals. The final panel of the conference, and second-to-last presentation, included neurologist Steve Novella, MD and psychiatrist Sally Satel, MD, both from Yale University. Dr. Heather Berlin was also slated to be on the panel but was not feeling well. Jamy Ian Swiss moderated the panel. The development of functional magnetic resonance imaging (fMRI) has given us the ability to see what is going on in the brain in real time. We can see what parts of the brain become active. The challenge, though, is pulling the signal from the noise. The media and neuroentrepreneurs misrepresent what fMRI can and can't do, giving us the impression that an fMRI image suggests that people are not responsible for their actions. But if one part of the brain becomes active, that doesn't necessarily mean that part is responsible for the behavior. Indeed, one part may be involved in multiple different types of behavior. So-called "brain training" sites, like Lumosity.com, are just one example of the over-hyped hyperreductionist view. The different between "brain training" and learning is just a matter of marketing. So far, it seems that practicing a particular skill will make you better at that particular skill, but it doesn't spread very far beyond that to become more generalized. Connected with this, if we see a neurocorrelate of something like pain or PTSD, it becomes "real" and somehow beyond our control. For example, the overhyping of neuroscience gives the impression that addiction is a brain disease. But addiction is different than other brain diseases, like Alzheimer's. The differences in the brain that give rise to addiction do not preclude changing behavior. You can't say to an Alzheimer's patient, "I'll give you $2 million if your memory doesn't deteriorate" but you could do something like that to someone suffering from an addiction. fMRI can tells us a lot about the mechanism of some disorder, but it hasn't yet told us much about treatment. This can lead to dubious claims, such as for acupuncture. When you stick a needle into someone, you can see a change in their fMRI scan. The view that this is a "real" effect is misleading. Of course you're going to see changes in the brain, but does that mean that it is really having any therapeutic effect? No. Our ignorance has almost increased more because of the advent of fMRI. So what good is fMRI if it can be so misleading? Is there diagnostic value in it? Well, that largely depends on how you're using it. It can be very useful for diseases like brain tumors, but for other mental disorders, such as schizophrenia, we're not there yet. Perhaps we'll never get there. With fMRI, we look for statistical differences between groups. Those differences, though, may not translate to the level of the individual. It's good for research, but maybe not very good as a clinical tool. More broadly, neuroscience is used outside of the research or clinical settings. Marketing is just one example of applied neuroscience. When you walk down the cereal aisle, products aimed at adults tend to be higher up, while sweeter cereals are placed at a child's eye level. And even the design on the box is applied neuroscience, with the eyes of characters looking down at the children passing by. I had to duck out before the panel finished so I could catch my bus home. I also missed the final presenter of the day, Baba Brinkman, a Canadian rapper. 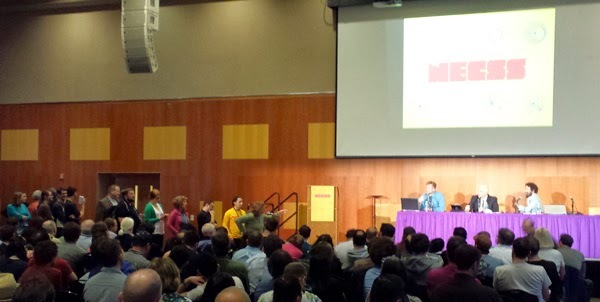 This was probably the best NECSS I've been to yet. The minor shifts in scheduling of outside events was a welcome change that allowed people to be more involved and interactive. The lineup of speakers was wonderful, offering something for just about everyone. I particularly liked the idea of having a debate. Although I found Mr. Mesh's arguments unconvincing, I do admire him for entering into an environment that was likely to be politely hostile to him. There are a couple of things that I would change. First, while the venue this year was in a good location, the space itself could have been better. Last year, I liked that the sponsors were able to set their tables up in a space separate from where the speakers were giving their presentations. That gave attendees a place to go and talk if they wanted to without disturbing the speakers, and it allowed them to check out the sponsors' information and merchandise, like t-shirts, etc. The other thing I'd change is finding a new emcee. Swiss is certainly a good magician and has stage presence, but he made some comments, both on stage and off, that diminished my opinion of him. He is certainly held in high regard among the community, and has a lot of connections, but a somewhat more personable host may work better. My little quibbles aside, it was a great weekend. It was wonderful learning new things, meeting new people and reconnecting with past friends and acquaintances. And for those who could not attend, video of the conference will be made available on the NECSS YouTube channel, where you can also find videos of past conferences.